Volunteering can do more than make you feel good. It can help strengthen your company. Volunteering shows what your company stands for, attracts people who want to help, encourages collaboration, improves employee retention, and enhances brand image. If you haven’t guessed it already, all of these factors help your company’s bottom line. More people want to work for you, and customers want to buy your products because they feel good about what your company is doing. Volunteering is a key part of any corporate social responsibility (CSR) program. Here’s why volunteering is invaluable to your company, and some tips on how to develop your program. Volunteer work is a great way to show employees your company’s core values. When employees volunteer, they live your values firsthand. Not only are employees more aware of the company’s mission, but they will also appreciate company­ organized community work. It also helps individuals grow. If you get people out of their normal schedules, they’ll think differently, come back refreshed, and have new ideas. In order to do this, create volunteer opportunities based on your company’s goals. Giving is positive and lighthearted. It sounds easy, but you can’t take it lightly. As with any business objective, sit down with your management team and establish a Volunteer Policy and Plan of Action. Determine what cause or causes match your values and business objectives. Volunteer programs are a must to attract talent. Even if people don’t take advantage of the volunteer benefit, they want to know it’s there. Fifty-nine percent of millennials now gravitate toward companies with pronounced CSR programs, according to a PwC millennials survey. Your volunteer program could very well be the difference in attracting an employee considering two different job offers, and encourage him or her to remain loyal to your company. Equally, your employees are motivated by a desire to give back to the world. Research from Cone Communications shows 74 percent of employees say their job is more fulfilling when given the opportunity to make a positive impact at work. Team-building can be extremely beneficial to your company. It facilitates new ways of working together. First, you need to determine your business objectives and ensure the volunteering supports it. Are you a small or large company? Is your company local or global? Be creative in the types of opportunities you offer and the times people can volunteer. Ensure you get team feedback as to the types of opportunities they’d like to see. A key trend is that managers are organizing volunteer trips as team building exercises. Pull employees from different business units who don’t normally work together. New ideas will flow! Volunteering helps companies enhance their corporate brand image. It’s important that local communities see beyond the company’s office buildings, its logo and it marketing. It’s interesting to note that 40 percent of Silicon Valley companies have one to four corporate sponsored events per year; and, even more impressive, 46 percent of companies hold 10 or more events per year (Silicon Valley Community Foundation). By volunteering out in the community, others will see your company’s presence in a positive light. When they think of your company’s product, they’ll think of all the good you do. Your product, and company, are associated with this good work. 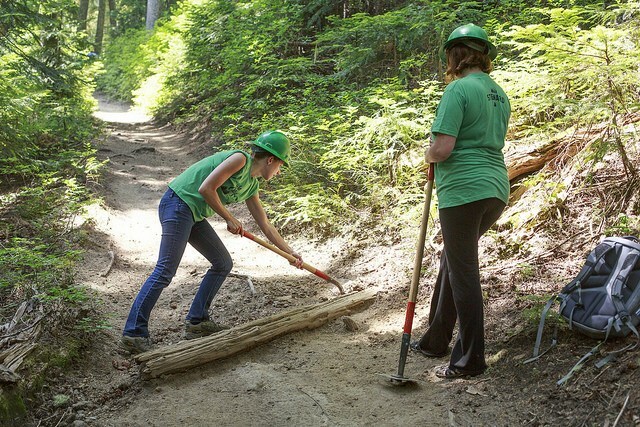 Employees volunteering in the community lend a new light of visibility to companies. People see you doing good, and it establishes trust in your company. It highlights corporate presence and brand – while helping a company’s bottom line. To build a successful corporate entity, people have to believe that their 12­-hour corporate days mean something. And while individual employees’ day­-to­-day work might not be in corporate foundation work, they still want to be associated with the good within your company. By incorporating volunteering into your company’s culture, you will see your company grow stronger and more resilient. You will help your business, and your communities. Finally, volunteering is not just about the act itself. A kind “volunteer mindset” starts the first minute of your day. It’s about helping others with their day-­to­-day tasks. It’s about being forgiving when others are under pressure. It’s about offering a helping hand, or a word of encouragement. That’s your best volunteer management program. If you aren’t living this, no volunteer work will help.